If you aspire to a relaxing bathroom that's free from clutter, these bathroom storage ideas could be exactly what you are looking for. It may seem like there is a lot of stuff that needs stowing away in a bathroom – the towels, hair products, medicines and the rest – so you might be pleased by how you can make storage a practical and attractive part of your scheme. First, take time to purge your bathroom of unused products, before you decide what kind of simple storage and practical bathroom furniture you need. Whether you're designing a bathroom from scratch and are looking for ways to maximise space, or need stylish, but affordable options to suit a budget-friendly bathroom, there's a storage solution to suit all. Purpose-built units are a great way of maximising space you have, no matter the size or shape of your bathroom. Bespoke options can be fitted floor-to-ceiling, with their sleek finish helping to hide pipework. This is the best way to add storage to every inch of your bathroom without overwhelming the space. For a similarly sleek finish, try Britton Bathrooms. The mirrored and gloss doors reflect light, lowering the impact of having walls covered in cabinets. When designing your bathroom, especially if floor space is at premium, incorporate some recessed shelves into your design. Recessed shelves are an unobtrusive way to store your bathroom essentials, plus they are usually going to be cheaper than a full on built in cabinet. Recessed shelves are usually build into a false wall so kill two birds with one stone and use the wall to cover up unsightly pipework too. We love how in this bathroom the backs of the shelves have been tiled to match the flooring. It ties the whole look together and stops a wall of white metro tiles looking too clinical. For similar tiles try Tile Mountain or for our pick of the best patterned tiles, head over to our buying guide. When choosing your bathroom sink, think about how to add some extra storage. A sink onto of a vanity unity is a an obvious choice but it’s not the only option. Check out how in this bathroom, a marble floating shelf has been built underneath the basin for a sleek, contemporary look. For more tips on how to choose to best bathroom sink, go and have a read through our guide. Same concept on a tighter budget – a shelf has been added underneath these double sinks and then the whole area painted in the same shade to create a seamless look. For more tips on how to design a bathroom on a budget it, check out our guide. If you have the space, adding a linen cupboard to you bathroom will give you ample storage for towels, spare bedding and bathroom essentials. Keep your linen closet organised with smaller storage like baskets and boxes, you could also add hooks for cleaning bits. In this linen closet, a space has been left at the bottom for a laundry basket, so you could keep that hidden away too. The downside to built-in sink units can be the sink taking up too much room, leaving minimal storage space underneath. When choosing a unit, it's important to opt for something with a couple of deep drawers and ample storage potential. Love the look of this bathroom? You are going to want to see the rest of this gorgeous log cabin. Looking for an unfitted bathroom storage solution? Pretty chests with simple silhouettes are a stylish choice for larger bathrooms. Opt for a unit with deep drawers if you're looking to store generous quantities of bathroom essentials, or fresh towels. We love this Angelique wide chest from Willis & Gambier. The open shelf is perfect for towels or baskets of your favourite toiletries, while the drawer can be used to hide anything that isn't as easy on the eye. Designed with narrow spaces in mind, slimline shelving is a must for small bathrooms. A combination of open shelving and closable cupboards is the ideal, allowing you to display prettier pieces and hide away the more unsightly bathroom necessities. We love the Silveran corner unit from Ikea but check out all of Ikea's bathroom storage, the have some great storage solutions for smaller bathrooms. 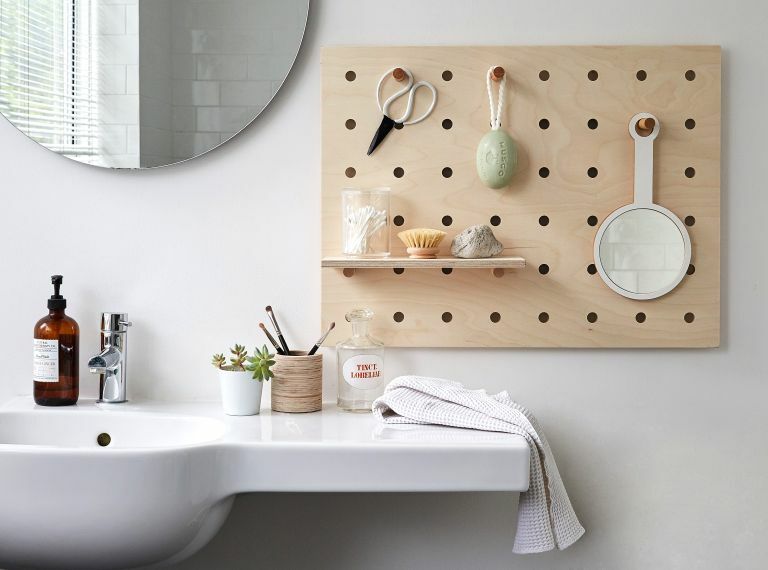 Check out more small bathroom storage ideas in our guide. f you need the storage space offered by a fitted vanity unit but want to maintain the more relaxed appeal of unfitted furniture, there are compromises that can be made. Choose an under-mount washstand with an open shelving unit. This can be dressed with wicker baskets and folded fresh towels for a boutique hotel feel. Available in three sizes, we love this Edinburgh Undermount Open Washstand from Neptune. Love this look? Go and check out the best vanity units for more inspiration. If your bathroom is large enough to allow it, rustic style cabinets make for great towel storage solutions and can be acquired for relatively little at reclamation yards and antique auctions. Don't be put off if the finish or colour isn't your style, you can always paint it – just go and have a read of our guide to painting furniture. If you're looking for a newer alternative, try Scumble Goosie or The French Bedroom Company. We all know a heated towel rail heats the room and holds your towels, but this clever washstand holds a sink and a shelving unit too, making it a four-in-one solution suited to small bathrooms. With its sleek and stylish design, the Large Basin Wash Stand from The Pure Bathroom Collection would be equally suited to a traditional-style bathroom as it would to something more contemporary. The humble stool is a great addition to a bathroom. It’s a fantastic little seat if you’re watching over your youngsters at bath time, or can be used for keeping freshly washed towels or your most used toiletries within easy reach. We love the simple design on the Blakeney Bathroom Stool from John Lewis, they have loads of handy storage (including that snazzy tallboy) so make sure you check our all of John Lewis' bathroom storage. If your bathroom is large enough, consider grouping pretty rattan or wicker baskets together – they make the perfect home for towels as well as hair and skincare products, while adding colour and texture to your scheme. We love these baskets from Dunelm, which can be easily stowed away when they're not needed. Top tip: they are the perfect place to fling all of the kids' bath toys next time you fancy a relaxing soak. Shop more of the best Dunelm bathroom storage. If floor space is tight in your bathroom, look for bathroom storage ideas that can be wall mounted or make use of vertical space rather than floor space. Here are some of our favourite products and ideas that do just that. Ladders, with their vertical proportions, are a stylish but functional bathroom storage idea – particularly if space is at a premium. Whether as a purpose-built shelf perfect for storing bathroom essentials or an actual ladder that's ideal for storing towels, there are different widths designed to suit every bathroom. With its slimline design, this wood finish ladder shelf from Dunelm is a practical option for storing towels when propped against a wall. If you do not have room for fitted cupboards, make use of any wall space by fitting a hook rack. This versatile bathroom storage idea can be used for holding baskets full of your products, or for hanging jewellery from. Understated and stylish, they're an easy addition to any bathroom and make the perfect hair tools and make-up storage. Want to replicate this look? All you'll need tare the SVARTSJON hook rack and NORDRANA baskets, both from Ikea. You can use it for hand towels too! Keeping clutter off the floor will take you one step closer to a neater and more spacious bathroom. Arranged with a combination of lovely looking bathroom essentials and more decorative pieces, a wall mounted shelving is a simple yet effective bathroom storage solution. It’s always a bonus if you can find a bathroom storage idea that serves more than one purpose. Mirrored cabinets do just that, storing bathroom essentials while hosting a practical mirror that not only helps you put your face on, but will also make a space seem larger and lighter. If you want your mirror cabinet to look more like a mirror than well... a cabinet, the Godmorgon unit is a great option. Plus it's mirrored on the inside too. Floating storage units are an effective option for creating the illusion of space and work particularly well in more minimalist spaces. Opt for a model with plenty of shelves for storing folded towels and bathroom bits and bobs. We love this Easy Oak option from Tikamoom, with its modern oak finish and generous shelving. It both displays and screens the things it stores. It's no secret that we are big fans of peg board. It's super versatile, looks great and doesn't take up much space – perfect if you are working with a smaller bathroom. This pegboard is from Kreisdesign, and it comes in natural birch plywood, white, green, grey or blue. It comes with a shelf and six pegs included, but you can add on more accessories to suit your bathroom storage needs. Looking for a simple and inexpensive way of tidying up your shower? Versatile and easy to install, shower caddies are designed to help you get organised quickly. They also mean everything you need for your morning wash is in easy reach. Sure there are some pretty unsightly shower caddies out there that risk ruining your whole bathroom's vibe, but we've found one that definitely ain't an eyesore. The black wire suction caddy from Dunelm definitely taps in to the industrial trend and comes in two sizes so you can pick based on how much you like to keep in you shower. The ultimate tidying aid, caddies are a great bathroom storage idea for saving space. Slide one down the side of the toilet for spare loo roll, or keep it stocked with your bathing essentials and hide in a cupboard, only to be brought out at bath time. For ease, make sure to choose one that's wipe-clean and water resistant, before stocking up with bathroom bits and bobs. Our fave is this one from John Lewis. Sure, purely functional items like cotton buds and makeup wipes don’t look all that great when they are wrapped in plastic, but stick them into some pretty glass jars, and you've got yourself a chic display. Not only do glass jars look lovely but they free up valuable cupboard space, making them the perfect small bathroom storage solution. These small glass storage jars are from The White Company. Check out more handy storage jar ideas.